I recognize that the theme of this conference is “shaping the future of learning” but I want to talk a little bit about the past. I want us to think about the ways in which the history of learning – how we tell that story – shapes the future of learning, and how the history of technology (education technology and otherwise) – and how we tell that story – shapes the future of technology. I want us to recognize there is a history even in the face of a fervent insistence that new, digital technologies are poised to sweep away traditional institutions and traditional practices. You know the stories: revolutions and disruptive innovations and other millennialist mythologies: the end of history, the end of work, the end of college, and so on. You hear a lot of these sorts of proclamations when it comes to “personalized learning,” which is (increasingly) frequently invoked in direct opposition to some imagined or invented version of learning in the present or in the past. Education technologists and futurists (and pundits and politicians) like to provide these thumbnail sketches about what schooling has been like – unchanged for hundreds or thousands of years, some people (who are clearly not education historians) will try to convince you. They do so in order to make a particular point about their vision for what learning should be like. “The factory model of education” – this is the most common one – serves as a rhetorical and political foil against which reforms and technological interventions can be positioned. These sorts of sketches and catchphrases never capture the complex history of educational practices or institutions. (They’re not meant to. They’re slogans, not scholarship.) Nevertheless these imagined histories are often quite central to the premise that education technology is different and disruptive and new and, above all, necessary. “Personalized learning” can mean that students “move at their own pace” through lessons and assignments, for example, unlike those classrooms where everyone is expected to move through material together. (In an invented history of education, this has been the instructional arrangement for all of history.) Or “personalized learning” can mean that students have a say in what they learn – students determine topics they study and activities they undertake. “Personalized learning,” according to some definitions, is driven by students’ own interests and inquiry rather than by the demands or standards imposed by the instructor, the school, the state. “Personalized learning,” according to other definitions, is driven by students’ varied abilities or needs; it’s a way of navigating the requirements of school bureaucracies and requesting appropriate accommodations – “individualized education plans” and the like. Or “personalized learning” is the latest and greatest – some new endeavor that will be achieved, not through human attention or agency or through paperwork or policy but through computing technologies. That is, through monitoring and feedback, through automated assessment, and through the programmatic presentation of new or next materials to study. 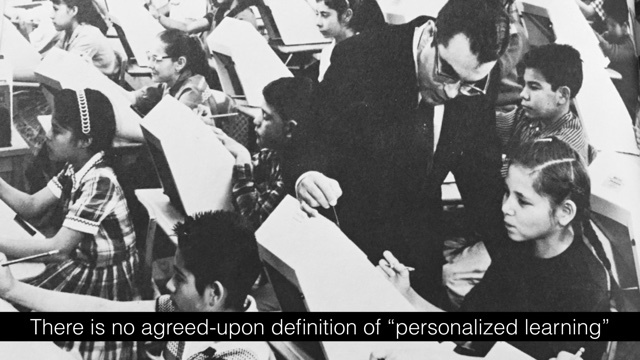 So, where did this concept of “personalized learning” originate? Who has propagated it? When? Why? 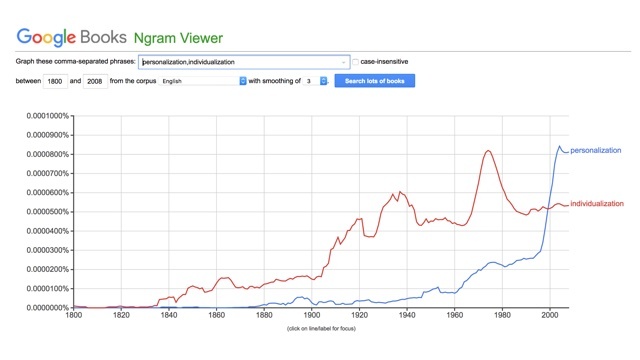 How has the meaning of the phrase changed over time? That’s a lot to do in a 20 minute talk, so I’m going to offer you several histories, origins, and trajectories of “personalization” more broadly – as a cultural not just technological or pedagogical practice. 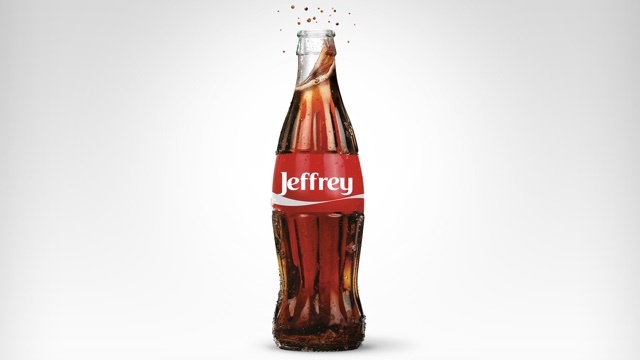 Online, “personalization” is how we – we the user and we the consumer as, let’s be clear, those are the frames – are convinced to take certain actions, buy certain products, click on certain buttons, see certain information (that is to say, learn certain things). 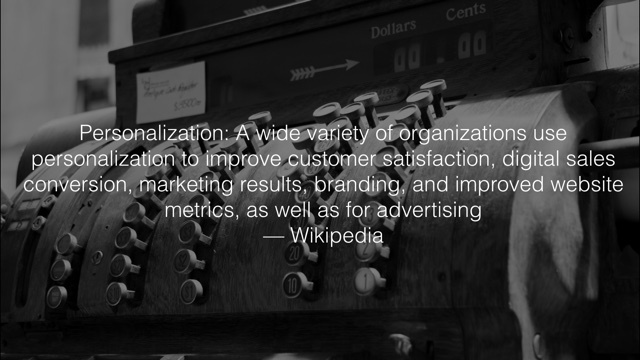 “Personalization” is facilitated by the pervasive collection of data, which is used to profile and segment us. We enable this both by creating so much data (often unwittingly) and surrendering so much data (often voluntarily) when we use new, digital technologies. 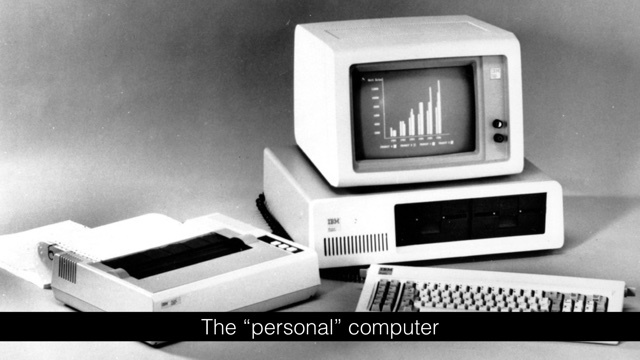 “The personal computer” and such. Among these first teaching machines was the one built by Ohio State University psychology professor Sidney Pressey. His device, “the Automatic Teacher,” was constructed out of typewriter parts. He debuted it at the 1924 American Psychological Association meeting. A little window displayed a multiple choice question, and the student could press one of four keys to select the correct answer. The machine could be used to test a student – that is, to calculate how many right answers were chosen overall; or it could be used to “teach” – the next question would not be revealed until the student got the first one right, and a counter would keep track of how many tries it took. The “Automatic Teacher” wasn’t Pressey’s first commercial move. In 1922 he and his wife published Introduction to the Use of Standard Tests, a “practical” and “non-technical” guide meant “as an introductory handbook in the use of tests” aimed to meet the needs of “the busy teacher, principal or superintendent.” By the mid–1920s, the two had over a dozen different proprietary standardized tests on the market, selling a couple of hundred thousand copies a year, along with some two million test blanks. 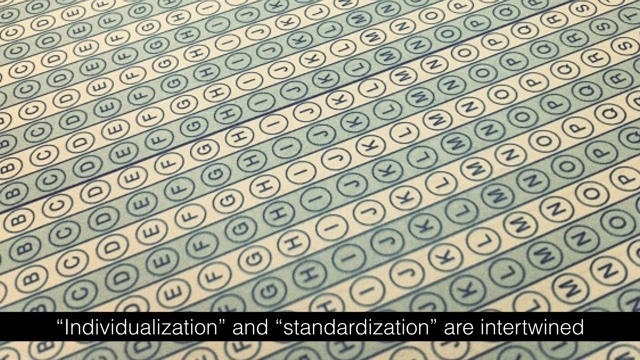 Yes, standardized testing had already become commonplace (in the American classroom at least) by the 1920s, and this practice placed a significant burden upon those teachers and clerks tasked with scoring them. Pressey argued that the automation of testing could “free the teacher from much of the present-day drudgery of paper-grading drill, and information-fixing – it should free her for real teaching of the inspirational.” No doubt, these arguments echo those made today about how ed-tech will free the teacher for more individualized attention, instruction, and remediation. But I think Pressey’s work also serves to underscore this other tension that we find throughout the twentieth century. This isn’t simply about “labor-saving devices” or instructional or administrative efficiency. The “Automatic Teacher” was also a technology of individualization, one that Pressey and others since have insisted was necessitated by the practices and systems of standardization in schools, by the practices and systems of mass education itself. It’s significant, I think, that early teaching machines were developed by psychologists and justified by psychology – very much a science of the twentieth century. After all, psychology – as a practice, as a system – helped to define and theorize the individual, “the self.” Self-management. Self-reflection. Self-help. Self-control. 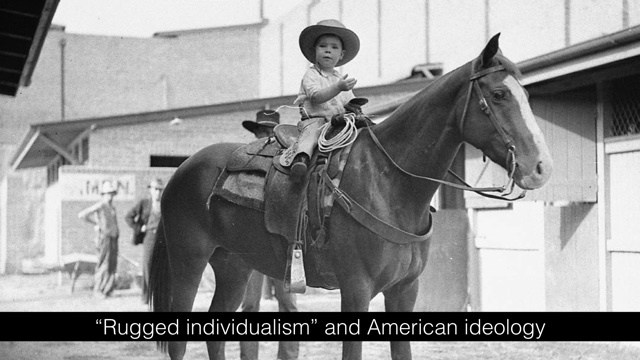 Individualization through teaching machines is therefore a therapeutic and an ideological intervention, one that’s supposed to act as a salve in a system of mass education. 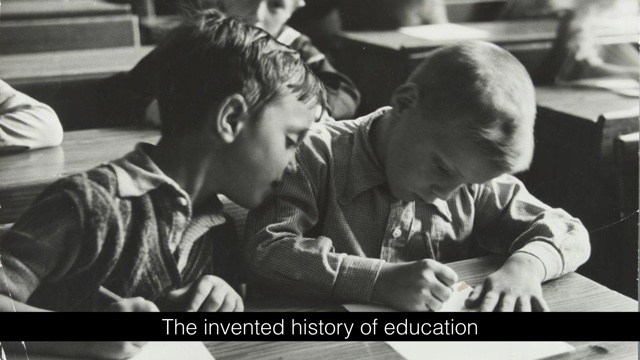 And this has been the project of education technology throughout the twentieth century. 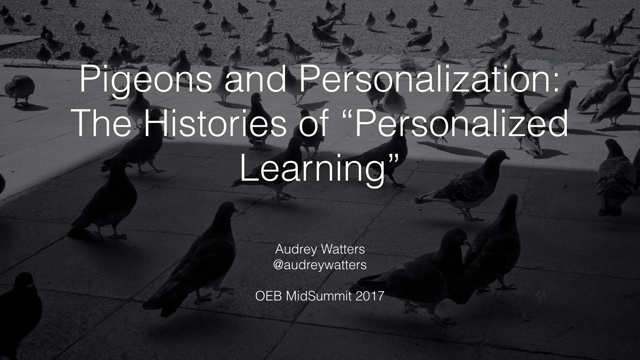 I recognize that I put “pigeons” in the title of this talk and I haven’t yet made the connection between the history of personalization and the history of pigeon training. It’s there in the history of educational psychology, in the history of behavioral modification, in the history of teaching machines. But I opted to scrap the ending I’d originally written for this talk – one that, I promise, tied it all together. Instead of the pigeons of ed-tech, I feel compelled to end with some thoughts on the politics of ed-tech. We now operate in a world in which we can assume neither competence nor good faith from the authorities, and the consequences of this simple, devastating realization is the defining feature of American life at the end of this low, dishonest decade. Elite failure and the distrust it has spawned is the most powerful and least understood aspect of current politics and society. It structures and constrains the very process by which we gather facts, form opinions, and execute self-governance. It connects the Iraq War and the financial crisis, the Tea Party and MoveOn, the despair of laid-off autoworkers in Detroit to the foreclosed homeowners in Las Vegas and the residents of the Lower Ninth Ward in New Orleans: nothing seems to work. All the smart people fucked up, and no one seems willing to take responsibility. We can add to Haye’s list, of course, more recent events: Brexit and Donald Trump and the latter’s withdrawal last week from the Paris Climate Accord. They can’t even get the weather report right, the President of the United States of America reportedly quipped to friends over golf; why should we trust climate scientists? This “death of expertise” has profound implications, no doubt, for the future of education, scholarship, teaching and learning, democracy. And, as Andrew Keen observed yesterday, we must consider the ways in which “populism” and “personalization” as cultural and political and economic forces might actually be intertwined – how the algorithmically-driven Facebook’s News Feed, most obviously, has only served to make things worse. For DeVos – and for many, many others – “personalized learning” means just this: “we need to be really intent on focusing on the needs to each individual student.” The needs of the individual to the benefit of the individual. But to DeVos – and to many, many others – exalting the freedom of the individual here also means freedom from government control (from government control over the education system). It’s not freedom from corporations, oh no; it’s freedom from the state and more explicitly freedom from the regulations that have been put in place in the last sixty years to try to force educational institutions to be more equitable. We heard Donald Clark argue yesterday that schools need to become unsafe spaces again, but let’s recognize that schools have never been “safe spaces” for most of the people on this planet. When Betsy Devos and others say that “we need to be really intent on focusing on the needs to each individual student,” what she doesn’t add is that all risk, in this worldview, would fall on the individual as well, of course. In a world with no institutions – unbundled and disintermediated as Silicon Valley is clearly keen to do – there are no institutional protections. With no government oversight, there is no appeal to civil rights. So this is our challenge in the face of those calling for “personalized learning” – the Betsy DeVoses and the Mark Zuckerbergs. And it’s our challenge, not only in education technology, but in democracies more generally: can we maintain a shared responsibility for one another when institutions are dismantled and disrupted? 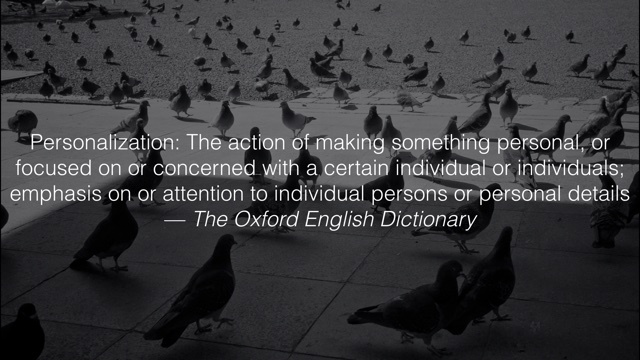 Will we have any semblance of collective justice in a “personalized,” algorithmically-driven world?